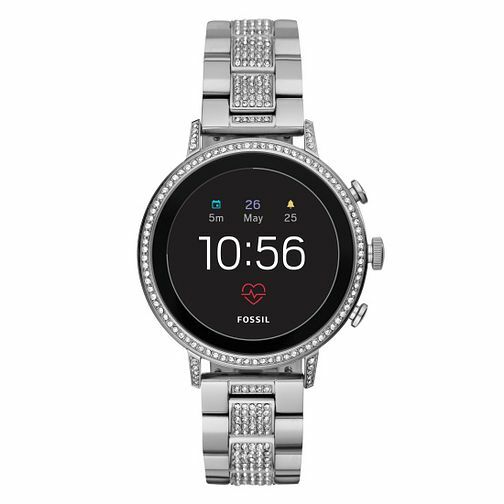 Mixing fashion with forward-thinking technology, the Fossil Smartwatches Venture Gen 4 ladies' watch pieces together the Smartwatch technology of today with the shimmering set stone appearance every woman needs to make a style statement upon her wrist. Made from silver tone stainless steel, this durable design displays a modish black face complete with a digital time, date, day, alarm and heart rate display. Surrounded by a shining set stone case, the silver tone stainless steel bracelet completes this smart and sensational look with co-ordinating shimmers. A beautiful display. Fossil Smartwatches Venture Gen 4 Ladies' Bracelet Watch is rated 3.0 out of 5 by 1.